Yerevan (Armenie: Երևան or Երեւան, Armenian pronunciation: [jɛɾɛˈvɑn]) is the caipital an lairgest ceety o Armenie an ane o the warld's auldest continuously-inhabitit ceeties. Situatit alang the Hrazdan River, Yerevan is the admeenistrative, cultural, an industrial centre o the kintra. It haes been the caipital syne 1918, the thirteent in the history o Armenie. The history o Yerevan dates back tae the 8t century BC, wi the foondin o the fortress o Erebuni in 782 BC bi keeng Argishti I at the wastren extreme o the Ararat plain. Efter Warld War I, Yerevan became the caipital o the Democratic Republic o Armenie as thoosans o survivors o the Armenie Genocide settled in the aurie. The ceety expandit rapidly durin the 20t century as Armenie became ane o the fifteen republics in the Soviet Union. In fiftie years, Yerevan wis transformed frae a toun o a few thoosan residents athin the Roushie Empire, tae Armenie's principal cultural, airtistic, an industrial center, as well as becomin the seat o naitional govrenment. Wi the growthe o the economy o the kintra, Yerevan haes been unnergoin major transformation as mony pairts o the ceety hae been the recipient o new construction syne the early 2000s, an retail ootlets sic as restaurants, shops an street cafes, which wur rare durin Soviet times, hae multiplied. In 2009, the population o Yerevan wis estimatit tae be 1,119,000 fowk wi the agglomeration aroond the ceety regroupin 1,245,700 fowk (2007 offeecial estimate), mair nor a third o aw the population o Armenie. The maist played an popular sport in Yerevan is fitbaa. Yerevan haes mony fitbaa clubs wi five in the 2010 saison o the Armenian Premier League. 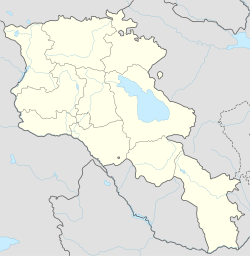 Yerevan haes fower major stadiums which are Banants Stadium, Mika Stadium, Republican Stadium an Hrazdan Stadium, alang wi twa sma anes; Nairi Stadium an Erebuni Stadium. Hrazdan is the main an biggest stadium which an aa hooses a sports complex that is componed o boxin an karate trainin facilities, soummin puil, basketbaw arena an tennis courts. The biggest indoor arena o the ceety an the whole kintra is the Karen Demirchyan Sports an Concerts Complex, which is maistly uised for Figure Skatin shows an concerts. Armenie haes aye excelled in chess wi its players bein vera aften amang the heichest ranked an decoratit. The heidquarters o the Armenian Chess Federation is locatit in the Kentron (central destrict) in Yerevan an thare exists plenty o chess clubs in the ceety. In 1996, despite a severe economic crisis, Yerevan hostit the 32nt Chess Olympiad. In 2006, the fower members frae Yerevan o the Armenie chess team wan the 37t Chess Olympiad in Turin an repeatit the feat at the 38t Chess Olympiad in Dresden. The Yerevan-born leader o this team, Levon Aronian, is currently ane o the warld's tap chess players an is nummer sax on the Aprile 2008 FIDE rankins. Yerevan is member o 6 internaitional organisations: the "International Assembly of CIS Countries' Capitals an Big Cities" (MAG), the "Black Sea Capitals' Association" (BSCA), the "International Association of Francophone Mayors" (AIMF), the "Organization of World Heritage Cities" (OWHC), the "International Association of Large-scale Communities" an the "International Urban Community Lighting Association" (LUCI). Currently, Yerevan haes thirty seester an pairtner ceeties. ↑ Katsenelinboĭgen, Aron (1990). The Soviet Union: Empire, Nation and Systems. New Brunswick: Transaction Publishers. p. 143. ISBN 0887383327. ↑ "Population of each district in Yerevan according to the city's official website". Yerevan.am. Retrieved 2010-07-02. ↑ "32nd Chess Olympiad: Yerevan 1996". Retrieved 2008-05-01. ↑ "AIMF: Liste des membres". ↑ "A Message from the Peace Commission: Information on Cambridge's Sister Cities," 15 February 2008. Retrieved 2008-10-12. ↑ Richard Thompson. "Looking to strengthen family ties with 'sister cities'," Boston Globe, 12 October 2008. Retrieved 2008-10-12. ↑ "Bratislava City - Twin Towns". © 2003-2008 Bratislava-City.sk. Retrieved 2008-10-26. ↑ "International Relations - São Paulo City Hall - Official Sister Cities". Prefeitura.sp.gov.br. Retrieved 2010-07-02. ↑ "Yerevan official web: Sister cities: Nice". Wikimedia Commons haes media relatit tae Yerevan. This page wis last eeditit on 10 Mairch 2018, at 19:27.